Russia’s original probiotic beverage is now soaked with fruit and a yeast fermentation starter, much like kombucha. AS AMERICANS, we might want to start cultivating an appreciation for Russian foods. This is not the venue to discuss why, but let’s just say it might become useful, when attempting to be upwardly mobile in the next decade, to be able to break bread with our future overlords. I don’t mean just vodka and caviar, both of which are easy to love. It might be time for us, as a nation, to put our beloved soft drinks (those fizzy symbols of America) on the back shelf. But this need not be as upsetting as it sounds. Fermentation is the new black where beverages are concerned, and the American palate that formerly knew only how to choose between Coke and Sprite is swiftly learning to appreciate the funky, sour tang of things like drinking vinegars, shrubs and kombucha (although the ones you buy here are still pretty sweet). And it’s not enough these days for a soda to be jewel-like and refreshing; it now also has to be alive, teeming with colonies of the kind of bacteria that we used to spend a lot of energy murdering but that we now cultivate like little tummy gardens. 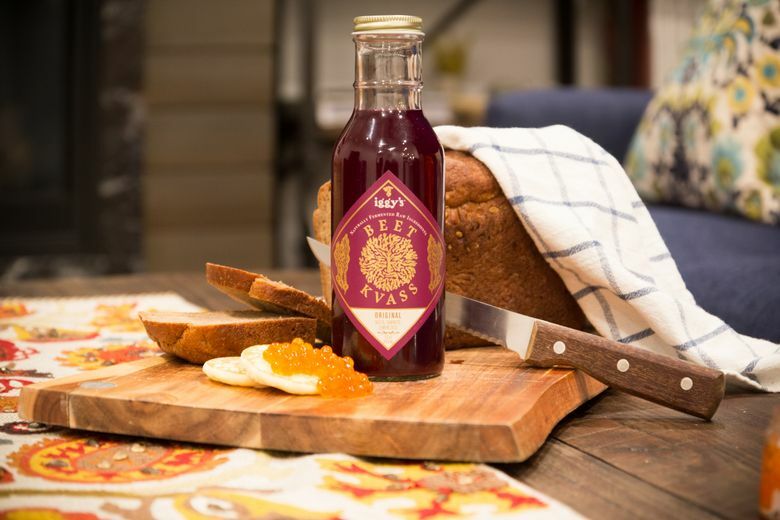 Thus, if you want to be on the cutting edge of probiotic potables (and adapt your gut to the foods of the motherland), you have to get into Russia’s original probiotic beverage, kvass. Primordial kvass was made by soaking old rye bread in water until the mixture turned brown and went slightly bad, which sounds like the kind of thing a person might brew up in a post-apocalyptic wasteland, or possibly just Russia during a bad wheat year. These days, the bread is soaked with fruit (apples, berries, sometimes straight sugar) and a yeast fermentation starter, much like the process used to create kombucha (and with a similar result). But while kombucha is made by adding a probiotic culture (aka a SCOBY) to brewed tea, kvass directly ferments the component ingredients themselves, making it closer to a drinking vinegar. Traditional Russian kvass is dark and cloudy, like an unfiltered small beer with a sour, pickly, almost-gamey flavor — a liquid concentration of the tang of Eastern European food. And kvass, like kombucha, is considered nonalcoholic (usually .5 to 2 percent alcohol by volume, at most) and was traditionally mostly a summer drink: the face-puckering, cloudy Gatorade of the Slavic old world. Though kvass is elbowing its way into the American palate through the inroads first made by its cousins kombucha and drinking vinegar, there still are only a few companies that produce and bottle anything labeled “kvass.” One of them is here in Seattle — Iggy’s, based on Bainbridge Island, makes beet kvass, a fermented-ish beet-and-carrot quasi-soda with a probiotic punch from the addition of lactobacillus bacteria (the kind in yogurt). Iggy’s kvass, though still pretty much unsweetened, is truthfully more akin to kefir water than to that soaked-bread libation of old. And, though it tastes a bit like fizzy salad dressing, it is far more palatable to the average modern American tongue (Iggy’s also makes several flavors of kombucha). You also can find kvass on tap at microbreweries and brewpubs across the city (I once had a particularly tangy, clear, kombucha-y version at the Masonry in Fremont). For a more authentic taste, the Russian version is on Amazon, though be warned: It looks like cola and tastes like old wet toast. But if you’ve been on Facebook or Twitter or any comments section of any article anywhere, you’re probably well-used to consuming a strange-tasting but oddly appealing Russian product, anyway, so … zazdarovje! Tantri Wija is a writer based in Seattle. Reach her at cheers@seattletimes.com.